The health benefits of potassium include such things as, relief from blood pressure issues, anxiety and stress, heart and kidney problems and are also responsible for enhanced muscle strength and water balance. The best potassium supplement is easy to take and provides you with benefits that are almost too many to list. Our pick, Pure Science Potassium Gluconate, comes from a company dedicated to producing the highest quality supplement you can purchase. Potassium is another important mineral that the body needs to function at its best. It also plays a role in taking care of the nervous system and keeping electrolytic functions normal. Potassium is such a major contributor in improving your health that it should not be overlooked when you want to improve your health or keep the good health you currently have. Potassium is found in a number of foods that you eat such as bananas, but since the average person’s diet isn’t always what it should be, it is preferable to take a good potassium supplement to ensure that you’re getting the right amount of this important mineral. The three supplements listed below will all provide what you need to supplement your diet and give you the needed potassium your body requires. If you are suffering from a potassium deficiency, this supplement is the answer. 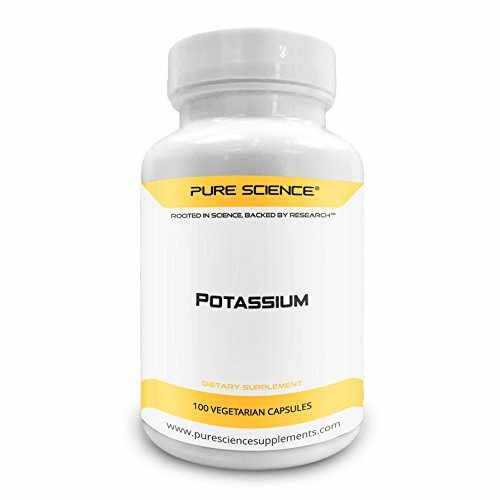 This potassium capsule from PureScience supports heart health and can regulate your blood pressure too. In addition to supporting heart health, potassium supplements can increase bone density and help users maintain their lean muscle mass as well. This product is GMP certified with the highest sourcing and manufacturing standards that PureScience stands for. The easy to swallow capsule is absorbed into the body much faster due to the special formulation. PureScience has a motto…”Rooted in Science, Backed by Research” and that is the motto they apply to every one of their products. They are dedicated to producing the best supplements so you can be confident that you have the best of the best. PureScience offers customers a money back guarantee that states if you are not satisfied with the purchase for any reason, they will refund your money. There is a two year potency date from the manufacture date. 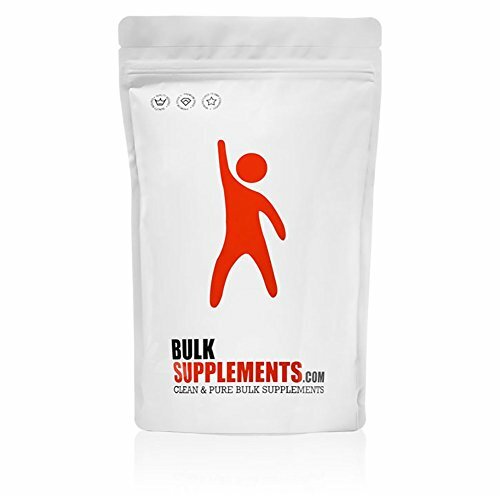 Bulksupplements offers customers a different form of vitamins that are great for people who don’t like to swallow pills. There are no fillers in this supplement, just pure, clean potassium powder. It comes in a factory sealed zip pouch made of foil. This product has been lab tested and guaranteed pure. It is a great supplement to help lower blood pressure. This bulk supplements potassium chloride powder is also used as a salt substitute by some people. Having a potassium deficiency can be very dangerous to your health for many reasons so if you want to ensure you’re getting the right amount of this important mineral, this is the product for you. Adding this supplement to your daily routine can help you maintain healthy muscle tissues, kidneys, heart, and more. It is an easy way to ensure that you have enough potassium in your system. Twinlab is known for its excellent line of supplements and this Potassium supplement is no exception to the quality they provide. You will get an all-natural potassium supplement that contains 99mg of potassium that comes from potassium aspartate and potassium citrate. Potassium ensures that all your cells, tissues and organs function the way they should. Healthy heart activity, smooth muscle contractions and a healthy skeletal system are just a few of the benefits that potassium provides. It’s crucial for healthy digestive function and normal muscular activity. 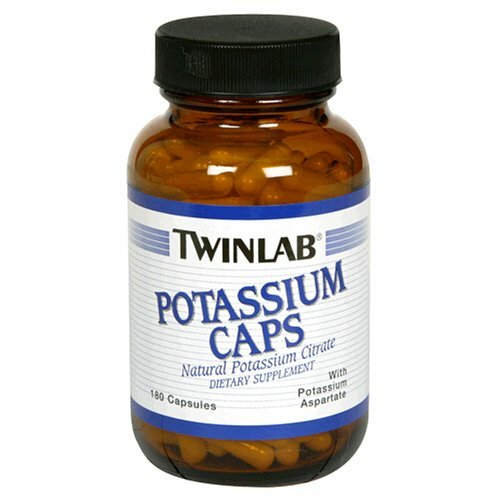 These Twinlab potassium capsules are simple to swallow and digest. They have no tablet binders, no added flavors and no coatings that can affect how it dissolves. You also won’t find any artificial sweeteners, salt, preservatives, colorings or salicylates. These are a great choice for getting the correct amount of potassium in your daily diet. These tablets are made in a GMP, NSF facility, ensuring your confidence in their quality and purity. Taking a potassium supplement has many benefits that affect all areas of the body including relief from heart disorders, anxiety, stress, blood pressure issues, and stress. You will also see increased metabolism, enhanced nervous system functions and better water balance as well. We have reviewed three of the top potassium supplements on the market that will help you add the proper amount of potassium to your system in a very easy way. All three of these choices are manufactured by well respected companies that are dedicated to producing top quality supplements and they have the certifications to prove that dedication. If you want to learn more about what potassium supplements can do for you and how to choose the right supplement for your needs, read the buyer’s guide below. It contains information that will tell you the factors that you should consider when you are looking for the right supplement out of the many choices that are available. After you read this guide, selecting the best potassium supplement for your needs will be much simpler. When a person is deficient in potassium, some serious issues can crop up as a result of this deficiency. Some of the more common symptoms of a lack of potassium include fatigue, abnormal heartbeat, anemia, severe headaches, muscle weakness, high blood pressure, swelling in the glands and more. On a more serious note, deficiency in potassium can even lead to diabetes. Dietary sources of potassium include vegetables, grains, and citrus fruits. Other sources include salmon, whole milk, almonds, fresh juices and chicken. The three most important sources of potassium include coconut water, avocados, and bananas. While all these foods sound terrific, the unfortunate truth is that most people have a very poor diet and they are not getting what they need from the foods they are eating. For this reason, taking a potassium supplement can be very valuable because it will allow you to get the added potassium you need and want to reap those positive benefits, and you won’t have to worry so much whether you are eating the right foods to get it that way. Some of the types above are good for treating all the reasons for potassium deficiency and others are more specific and are better for certain situations. Depending on the form and manufacturer, the potassium may be made for slow absorption and some will be designed for quick absorption. If you are looking for extended release capsules or tablets, make sure that they are not chewables. You want to find supplements that are easy to swallow whole. The powdered, granules and liquid varieties are great for those who don’t like to swallow pills. Make sure to think about how you like to take your supplements when you are looking for the right one for your needs and preferences. If you can’t swallow even the tiniest pill, looking for a supplement that has to be swallowed is setting yourself up to fail. Look for a supplement that fits your preferences as well as your needs and you will be certain to purchase one that you will continue to take. You can’t get the benefits if you’re not taking it. There are many health benefits that you can receive by adding a good quality potassium supplement to your diet. Potassium is considered a major nutrient that the body needs for good health. We’ve listed many of the benefits that you can receive by adding potassium supplements to your daily regimen. Protects from Strokes – Potassium has a very important role in keeping normal brain function. It achieves this because high levels of potassium have been shown to routinely allow larger amounts of oxygen to get to the brain. This increases cognitive function and stimulates neural activity as well. These high levels of potassium can prevent strokes from happening in the brain. There has been a link found between people that suffer from strokes and a deficiency in potassium. Potassium acts as a vasodilator which means the blood vessels relax throughout the entire body when potassium levels are correct. The blood flows much easier and freer and that makes it less likely to form clots that break off and cause strokes. Helps normalize blood sugar levels – A lack of potassium can cause a drop in blood sugar as well. These decreases in blood sugar cause many different problems like weakness, nervousness, trembling, sweating and headaches. You can see immediate relief from these symptoms by taking in potassium chloride and sodium. Keeping your potassium levels stabilized prevents spikes and dips in the insulin and blood sugar levels. Muscle Cramps – low potassium in the blood can cause muscle cramps to occur. You can eradicate these cramps by eating one banana each day. The high levels of potassium in bananas prevent these painful cramps and provide all the other benefits as well. Blood Pressure – Potassium can have a big effect on normalizing blood pressure. It is a crucial element in the stabilization of blood pressure which reduces the risk of hypertension and other heart diseases. Regulating blood pressure is probably the single most important job of this mineral. One of the main causes of blood pressure is tension of the blood vessels. Potassium reverses this problem which in turn helps lower blood pressure. Metabolism – Potassium has some metabolic effects as well. It helps the metabolism of fats and carbohydrates and extracts energy from the nutrients that are in the foods you consume. Studies have further shown that potassium is a major player in the synthesis of different proteins which has an impact on balancing the metabolism, cell growth and regenerating tissues. Potassium is definitely a supplement where too much is NOT a good thing. Too much potassium can actually be very dangerous and lead to tingling in the hands and feet, nausea, trouble breathing, heart arrhythmia and more. While it is a terrific supplement and provides a lot of incredible benefits to your body, you need to always be aware of the right dosage for your needs and not go over that. If you have consulted your doctor and are in the market for a potassium supplement, you have all the information you need to sort through the different offerings and find the one that is the best for your needs, preferences and body. Being confident about the supplement you purchase will ensure that you actually take the supplement rather than just purchase it and forget about it in the medicine cabinet. Don’t expect overnight results but you can usually expect to start feeling some differences very early on. You should try to remember to take it according to the doctor’s orders or dosage instructions. Potassium is a key mineral your body needs to stay healthy. Finding out your levels and taking a good quality, easy to take supplement to make up any deficiencies you may have can improve your health in many ways.